Throughout history, people from different cultures and religions have extolled the value of fasting (Butcher, 2007; Clark, 2000; Houston, 1998; Rader, 2005; Suvarna & Nirgun, 1974). Numerous references to fasting appear throughout literature: in the Bible, the Qur’an, the Torah, pagan writings, and manuscripts of the ancient Greeks (Ferm, 1945; Rader, 2005; von Braun, 2007; Wedeck & Baskin, 1971). Fasting was a practice in the ancient mystery schools created by the teachers and masters of the mystery religions of Egypt, Greece, and Rome (Stone, 1997). Fasting has been used as a means of releasing emotions and connecting one’s soul with the sacred, particularly at significant transition points throughout life. In addition to its function as preparation for divine revelation, fasting has also served as a prelude to important events in a person’s life. Through these mechanisms, fasting became a means of transformation. Len Sperry (2001) said, “Done as a spiritual practice, fasting is defined as abstention from food for the purification of one’s motivation. All the great spiritual traditions recognize its merits” (p. 154). Sperry suggested that fasting can be an extraordinarily transformative spiritual practice, “More than any of the other spiritual practices, fasting can surface and uncover not only the obvious but also the more subtle cravings and desires that control one’s life” (p. 154). Across religions and spiritual traditions, the definition of fasting differs, as does the rigor. Catholicism’s Lenten fast calls for the avoidance of meat, but not food altogether, while some individuals have fasted on only water for 40 days in observance of Lent. The Islamic fast during the month of Ramadan requires followers to avoid food and drink from sunrise to sunset, allowing them to eat from sunset to sunrise. The Judaic fast of Yom Kippur traditionally is a dry fast that begins before sunset and ends after nightfall on the following day. Even among these religions, fasting has been practiced in extremes, including fasting for prolonged periods without water or even fasting to death. In fact, among all religious traditions, Zoroastrianism is the only one that forbade fasting (Merriam-Webster, 1999). In all religions that embrace fasting, the fast is a means with which to access a relationship with divinity. Lynne M. Baab (2006) explained this phenomenon, “Fasting, at its core, is not a discipline of withholding. Fasting is a discipline of making space for God” (p. 27). 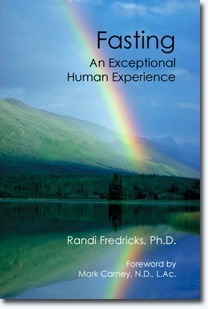 The above excerpt is reprinted from Dr. Randi Fredricks’ book Fasting: An Exceptional Human Experience © 2012 and the chapter Fasting and Transpersonal Psychology. No part of this article may be reproduced in any form or by any electronic or mechanical means, including information storage and retrieval systems. Disclaimer: This article is not intended to provide medical advice, diagnosis or treatment. Views expressed here do not necessarily reflect those of Dr. Randi Fredricks as articles often present the published results of the research of other professionals. Copyright © 2012.